A recipe for toast? Well, barely… more like a ‘suggestion’ for a good combination of savoury flavours! Use whatever dark miso you have on hand- mugi (barley) or genmai (brown rice) are best. Give the sprouted grain bread a try- it’s delicious, moist and digestible. Make sure you cut it with a sharp, wet knife and toast it a little longer than you would other bread: it’s very dense, meaning a little bit goes a long way. Double, triple or quadruple the quantities given according to how hungry you are / number of hungry mouths. 1. Toast bread until lightly brown and spread with miso. Arrange avocado on top and season. 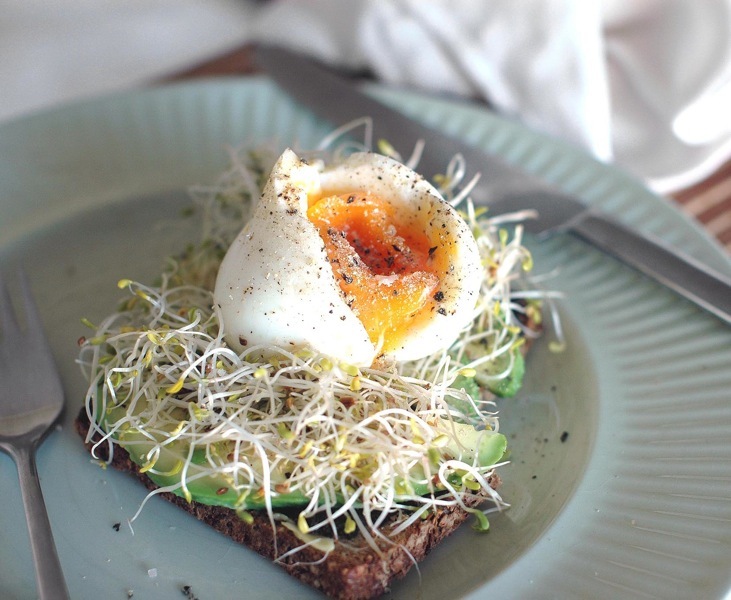 Arrange sprouts on top, then egg and season well.